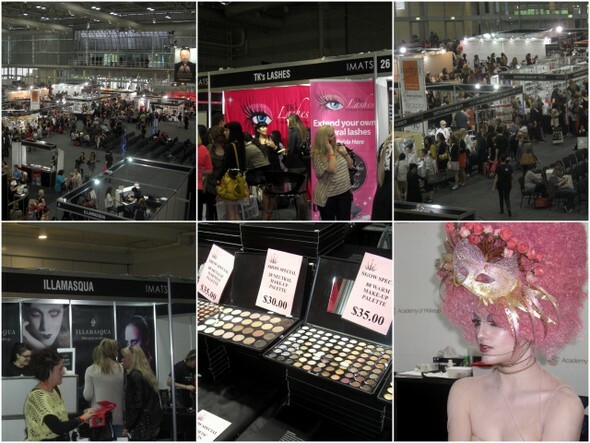 This past weekend I attended the International Makeup Artists Trade show in Sydney's Darling Harbour (I first wrote about it here), which was part of the Australian Beauty Bloggers Weekend. More on the ABBW later... it was just so full on (in a good way) that I still need to get my thoughts together before I can put it in a post. But for now, here's what I bought at IMATS, some at absolutely bargain prices. All up I'm quite happy with my purchases at IMATS, I don't think I went too nuts and overspent. I mainly bought things I hadn't tried before or needed them, or were such a good bargain I just couldn't pass them up. This was the first time Illamasqua was at the show, so they only had a small stand. They didn't have the full range, just a few key pieces, but at 75% off those products at the show how could I resist? The blush ($15 at the show) seems like a perfect colour for contouring. The eyeshadow ($10 at the show) is a matte brown shade so I plan on using on my brows, and the lipgloss ($15 at the show) is such a "me" colour that I couldn't leave it there. I'm really looking forward to trying this one, because I've read so many good things about this foundaton before. MUFE is only sold at one shop in all of Australia (as far as I know), and it's nowhere near where I live. So this was definitely a brand I was looking forward to trying. I paid $42 for this at the show, but I think the normal price is $59aud. I've never tried Spa Ritual polishes, mainly because I don't know of any stores that sell them here besides their online AU store. They were $11.95 at the show, or $19.95 on their website. Another brand that I haven't tried before, as I find them quite pricey and not knowing much about them I don't want to spend all that money on their products. Yes, I know that I don't need yet another bright pinky coral lipstick, but it was down to $15 from their usual $35 so of course I couldn't pass it up! 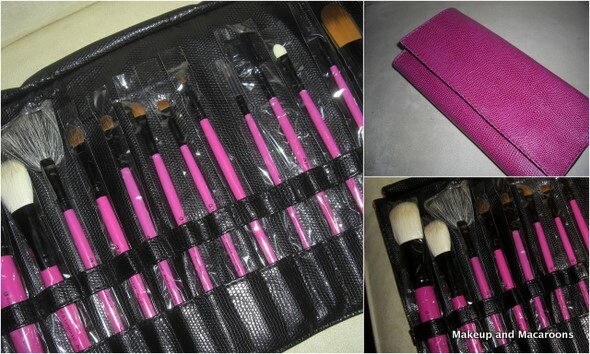 This looked like too good a deal to pass up, $25 for 13 brushes which come in this hot pink travel pouch. I haven't tried these yet, so I'm hoping these are good quality. 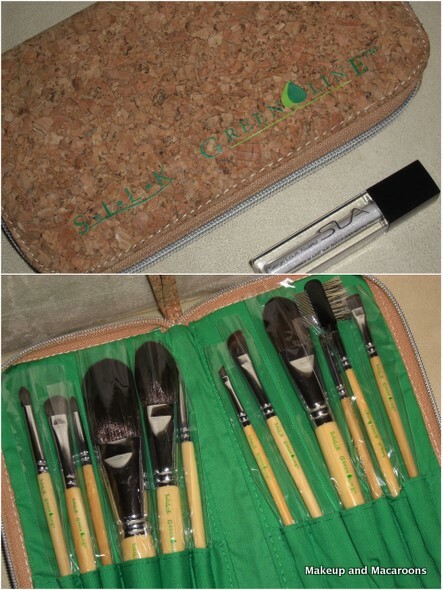 Because I was part of the ABBW crew, we were all given a Royal & Langnickel Silk Pro Greenline Eco Friendly 12 piece brush set. There was also a lucky dip prize for us at SLA Makeup, and I got a sparkly shimmer powder roll on. I'll leave you now with a collage of pics I took at IMATS and a sneak peek at the goody bags we were given by all the fabulous sponsors of the ABBW2011. The goody bags from ABBW... we were so spoilt, so very very spoilt. Did you go to IMATS this year? Have you tried any of the products that I've bought? Good Haulage!! I got the Royal & Langnickel Travel Brush Set as well but let's face it - pretty much only cause it was PINK!! hahaha!! Nice haul! The brush set is so affordable. You got some really great stuff!! Great haul - wish I could have gone! WOW!!!!! im a little envious at all your new products to your makeup collection :) nice work! Wow you move quickly! Dedicated blogger! Great haul, Illamasqua was a definite must buy at IMATS but it was a shame they didn't have a wider range of products. I was dying to get to the MUFE stand but it was too crazy and intense for me I didn't bother. Can't wait to hear what you think of the HD foundation. Okay so...so...wait...there are discount prices at IMATS? NOOOOOOO. I regret not going to mine even MORE now. Oh my, no doubt about it, I HAVE to go to IMATS next year!! Thanks for your comments ladies. If you get a chance to go to IMATS I highly encourage it. The discounts you get there make up for the admission fee for sure! And OMG I can't wait to see what's inside all those goodie bags! Vintage Makeup - thanks hun, if you do get the chance definitely go, you won't regret it. Red Lips Black Hair - I love my Illamasquas, so glad I got them on sale. Silhouette Screams - From what I've seen of Belladonna it looks to be slightly darker than Frenzy so I might not get it after all. And sounds good, will do a comparison to Impassioned in the next few days. lillie - thank you, I'm really happy with the deals I got. I'm with you! It was such a full on weekend I have avoided even touching my suitcase! I'm trying to get my mind around just how much we were given by such generous sponsors. I cant even get my mind around writing a blog at the moment. FABULOUS HAUL!! The Royal & Langnickel brushes look great!